Without a doubt, my heart is still broken from Saturday’s loss in PKs to Duluth FC in the Midwest Region Final. 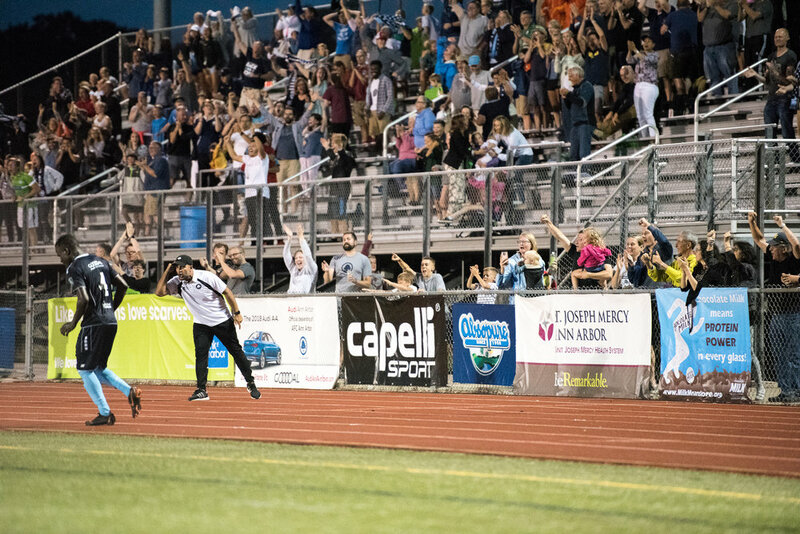 As tough as this loss is, the things we’ve accomplished this season and the memories we’ve created together between the players, coaches, supporters and staff, help remind me how lucky I am to be the Chairman of AFC Ann Arbor. One of those moments came in Saturday’s loss, in stoppage time, when AZ scored to send the match to OT. I’ve had multiple staff members, players and plenty of fans tell me they teared up and some even cried at that moment. I was on the sideline at the time preparing the post match ceremonies, and I don’t know what came over me I just looked at AZ and started screaming things trying to channel my inner Eric Rudland, all while the entire stadium chanted COYMO. For me, that will always be one of the greatest moments in club history. Winning the Great Lakes Conference title for the second consecutive season was huge because out of the current teams in the conference, we are the only one to win back to back titles as well as make back to back appearances in the region finals. Add to that the lowest goals per game average in the entire country plus close to a dozen team records and I think we’ve confirmed that we’re one of the most competitive teams at our level. Off the pitch, we did some special things this season including launching our non-profit sister, The Mighty Oak Youth Project, aimed at increasing access to soccer through financial support, clinics and equipment donations. TMOYP is in its infancy but has already provided five youth scholarships for travel soccer thanks to support from amazing partners like Saint Joseph Mercy Health System. TMOYP also teamed up with the United Dairy Industry of Michigan and 2x Gold Medalist, Lindsay Tarpley, to launch Community Kicks and held four clinics in Portage, Muskegon, Ypsilanti and Detroit that reached children in underserved communities who the majority of had never played soccer before. Different clubs measure success differently, but for us it’s a mixture of on-field performance, community impact, creating opportunity for our players as well as making sure we’re continuing to be financially sustainable. It’s great to say that in our fourth year, we have had our most successful year yet but we are only looking forward and hope to continue to do more on and off the pitch. Our success on the pitch is driven by Eric Rudland and his amazing coaching staff of Boyzzz Khumalo, Ron Rudland, Jeff Shuk and Rod Asllani. The assistant coaches, and the Director of Soccer Operations, Tito Schwabe, are probably the biggest unsung heroes of our team. They are the ones at training day after day, helping develop our culture and building our environment. All under the guidance and leadership of our trusted leader, Eric Rudland. In Rudland We Trust is the truth. We are beyond lucky to have him in Ann Arbor and I can’t even begin to explain how much I’ve learned from him. I appreciate everything you guys do for this club and look forward to continuing our work together. Thank you all for your support throughout the 2018 campaign. Special thanks to our amazing and dedicated sponsors as well as our Premium, General and Youth Members who make what we do for the community possible. A very special thank you to the Main Street Hooligans who were louder than any previous season. I’ve been able to get to know so many of our supporters over the past few seasons and it’s an honor to call so many of you friends now. And of course, thank you to the amazing staff, mostly for putting up with me, but obviously for your hard work and dedication to the club. Bruno, you are a wizard my friend and I’m lucky to have had you by my side for the past eight years as a friend and colleague. Lastly, to the guys. Coach said it best when he told us the hardest part isn’t losing, it’s knowing that our time together has come to an end. I know, you guys know, how much I care about you and that you’ll always be a part of the AFC Ann Arbor Family. But don’t forget how proud I am of each and every one of you. You represented this club and community with such pride and heart, and for that I am forever grateful.